When I pulled into the parking lot below the world’s largest ketchup bottle there was a man talking on his cellphone. I snapped a few photos and scribbled some notes on the hotel pad I keep in my tankbag. During the few minutes I was there fussing around, the man finished up his call and began walking towards me. With a toothy grin, he said a quick hello and asked if I’d like him to take a picture of me with the ketchup bottle. He said he gets that request a lot. 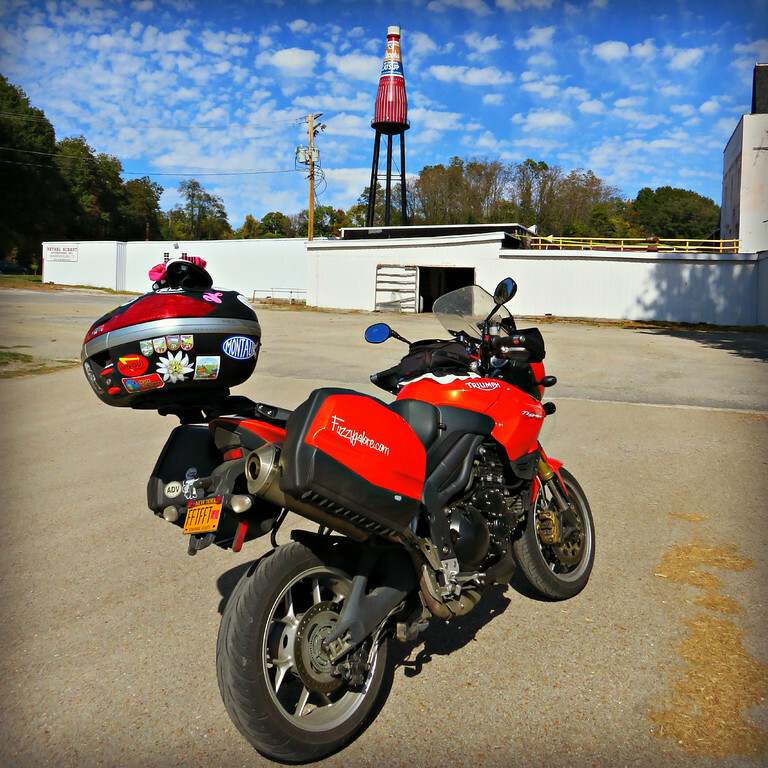 The big ketchup bottle is a big draw to the town of Collinsville, Illinois. The man also asked where I was from and if I was doing “the Route 66 thing.” Apparently he’s lived in Collinsville his whole life, there in the shadow of the big ketchup bottle and seemed pretty content with that. 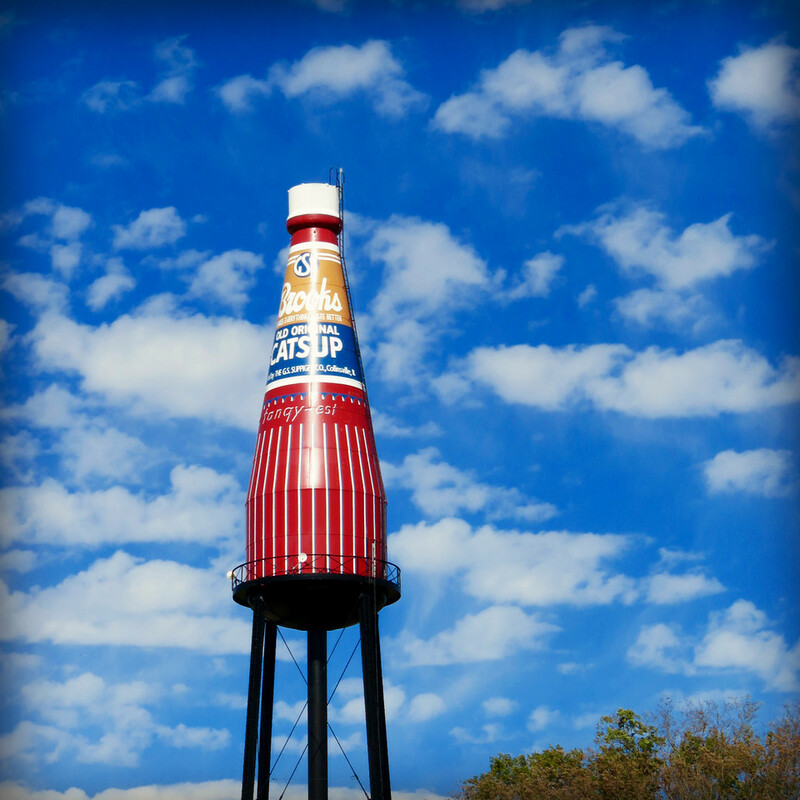 Just how big is the World’s Largest Catsup Bottle? It’s 170 ft tall. That’s a 70 ft tall riveted steel bottle on top of 100 ft tall steel legs. The diameter at the base of the bottle is 25 ft and the diameter of the cap is 8 ft. It has a capacity of 100,000 gallons. You could’ve been the star of the PBS show! Time for Roadside Americana Part II? 😆 wouldn’t that be fun? If only i could find a way to make a living doing something I loved. ::sigh:: That’s everyone’s dream though, isn’t it?